Interpersonal Relationships and Health Agnew Christopher R., South Susan C.
Authors: Agnew Christopher R., South Susan C.
Add to cart the imprimé à la demande of Agnew Christopher R., South Susan C.
Gathering leading thinkers in social and clinical psychology, public health, medicine, and sociology, Interpersonal Relationships and Health considers theoretical and empirical issues relevant to understanding the social and clinical psychological mechanisms linking close relationship processes with mental and physical health outcomes. The volume arises out of a recent explosion of interest, across multiple academic and research fields, in the ways that interpersonal relationships affect health and well-being. This volume pulls together a range of scholars who focus on different aspects of relationships and health in order to encourage both collaboration and cross-disciplinary initiatives. This is the first edited volume to pull together noted experts across myriad disciplines whose research is at the intersection of human relationships and health. Topics addressed include key biological processes that influence and, in turn, are influenced by close relationships. 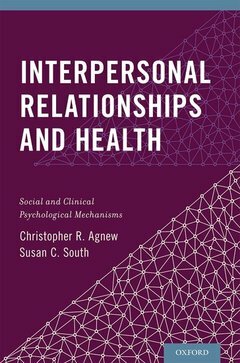 Interpersonal Relationships and Health presents research that demonstrates the connections between interpersonal relationships, mental and physical health outcomes, and biophysical markers that figure prominently in the fields of psychoneuroimmunology, endocrinology, and cardiology. In addition, it highlights recent work on marital, family, and social relationships and their interplay with health and well-being. Chapters also address sexual health among young and older adults, as well as clinical intervention efforts that focus on the role of relational factors in influencing health. Each chapter highlights extant theoretical and empirical findings and suggests future avenues for research in this burgeoning area. Christopher R. Agnew, Ph.D., is Professor and Head of the Department of Psychological Sciences at Purdue University. His research focuses on close, interpersonal relationships and the use of relational models to understand broader social and health processes. He is a Fellow of the Association for Psychological Science, American Psychological Association, and the Society of Experimental Social Psychology and served as President of the International Association for Relationship Research. Susan C. South, Ph.D., is Assistant Professor of Clinical Psychology in the Department of Psychological Sciences at Purdue University. Her research investigates the links between marriage and personality and psychopathology. She has published widely on the assessment of marital satisfaction, the links between mental illness and marital distress, and the gene-environment interplay between marital dysfunction and mental illness.